THAT Seiko managed to pull off an April Fools’ prank in which it announced the “release” of a Seiko Presage with a dial made from senbei, the crispy Japanese snack, partly rested on the fact the watchmaker has lately been successful in employing all manner of finishing techniques on its watches’ dials, counting in those in the Presage collection. From turning out various surface patterns to using fired enamel or exotic Urushi lacquer, Seiko has been quite prolific at such moves in recent years. Suddenly, a Presage with a rice crispy dial does not sound so preposterous at all. So, bite, a lot of folks did. 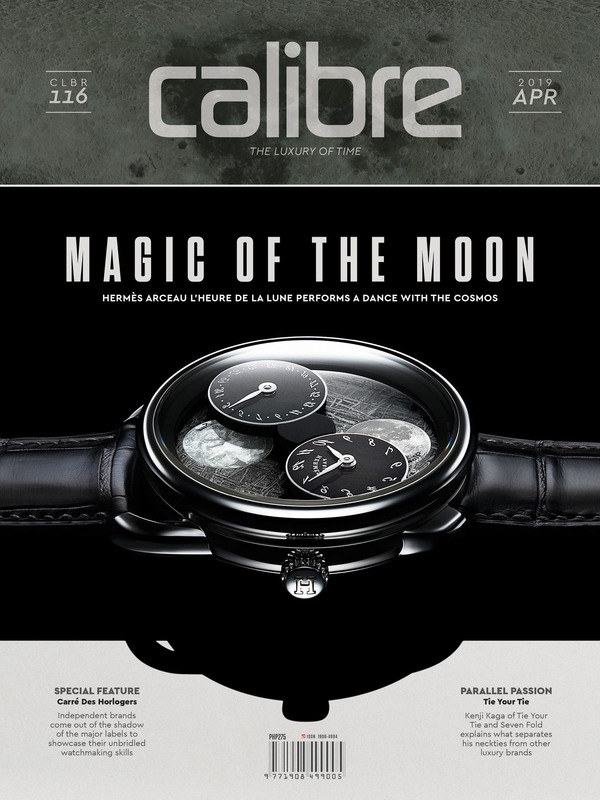 A couple of weeks before April Fools’, though, Seiko at the 2019 Baselworld also indulged in a bit of humor by repeating a previous skit. In presenting a new Presage model to the global press, the watchmaker wheeled out a comical “pastry chef” who “baked” watches’ dials in an “oven.” Unconventional as the pitch may have been, its point was delivered across succinctly; this was no ordinary Presage. 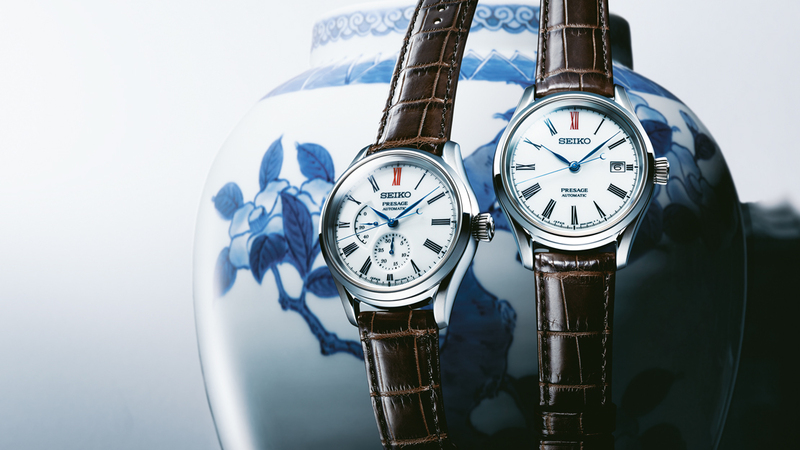 Make that two new special Presage models, the Presage Arita Porcelain ref. SPB093 and ref. SPB095. 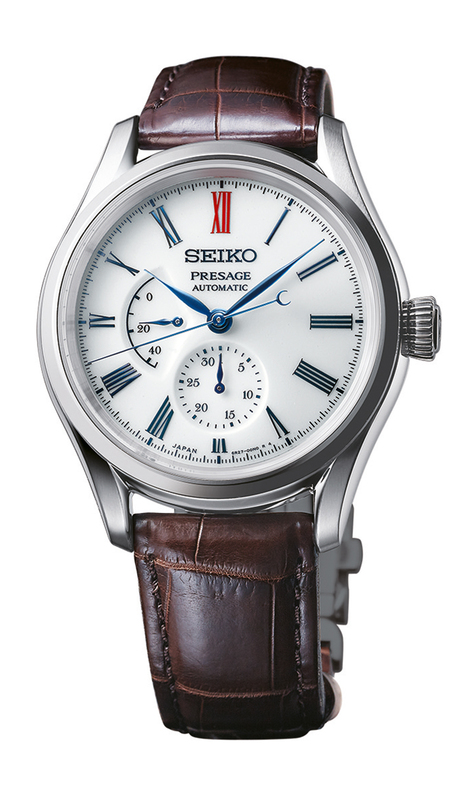 The first model has a date subdial and a power reserve meter (and powered by Seiko’s self-winding cal. 6R27), the second is a simple three-hander with a date window and is spun by the familiar cal. 6R35. The cal. 6R27 operates at 28,800vph and has a power reserve of 45 hours, the cal. 6R35 at 21,600vph and packs 70 hours. Both are housed in steel cases — 40.6 millimeters across for the SPB093, 40.5 millimeters for its sibling — and are defined by Roman numeral hour markers (blue in the SPB093) where 12 o’clock is red, as well as blue leaf hour and minute hands. Both watches’ second hand is adorned by a crescent “counter balance.” As far as specs go, and as excellent as these may be, there are nothing quite extraordinary about them; these are Seiko staples. The dials, though, are a different matter. Arita identifies them as a special type of porcelain indigenous to the small town of Arita (its population is less than 20,000) in Kyushu, southern Japan. The porcelain is produced by local artisans from clay found in the area. At times referred to as ‘‘Imari ware,’’ after the port from which most of the porcelain was shipped (especially when Japan emerged from seclusion in the late 19th century), Arita has since the 17th century been a coveted commodity both domestically and in Europe. And for good reason, too. Arita porcelain’s distinct texture and rich depth are as much the result of expert touches as they are of the local clay. The wares were initially defined by their Chinese-inspired blue decorations (explaining the blue hour numerals on the dial of the SPB093), but craftsmen soon adopted ornate multi-colored designs using overglaze enamelling techniques. 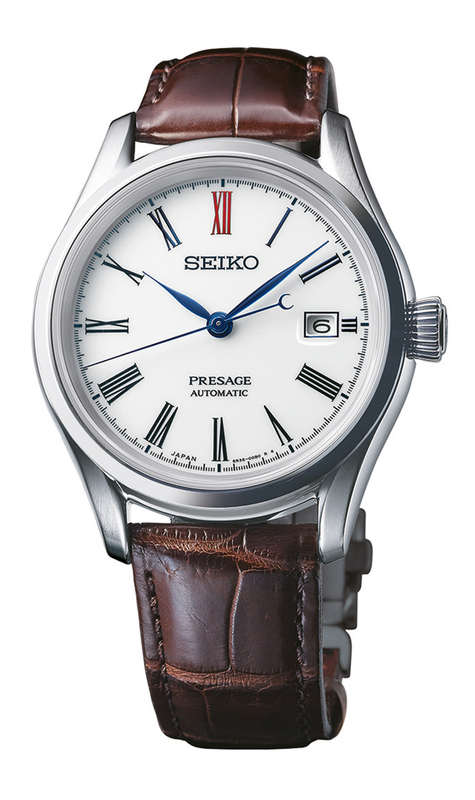 In making the dials of the new Presage pair, Seiko turned to master craftsman Hiroyuki Hashiguchi who, like his colleagues, are based in Arita. The watchmaker said that for the last three years, the Presage team has been working with Hashiguchi in developing a new Arita porcelain material for the dials. The effort resulted in a substance more than four times harder compared to traditional Arita porcelain. 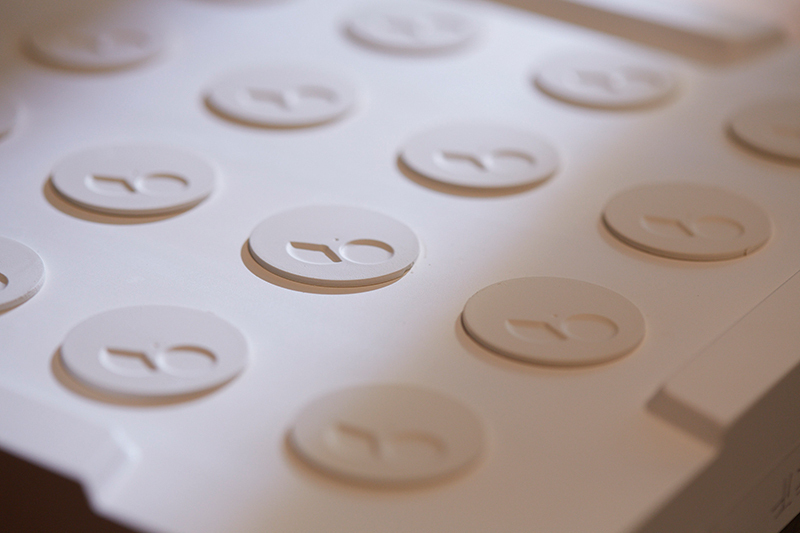 The process of making the porcelain dials starts with the base material being placed in special molds, then dried and fired in a kiln at temperatures of 1,300 degrees Celsius. This hardens and whitens the material. 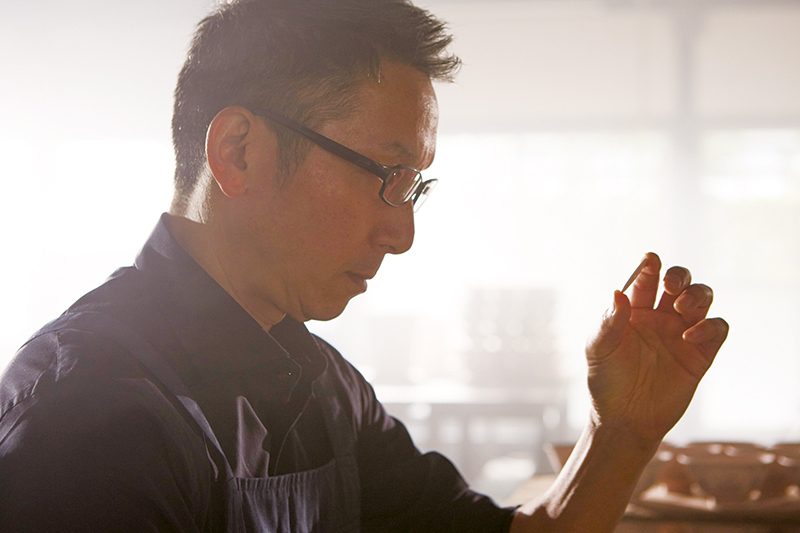 Hashiguchi and his team then apply the glaze by hand. Next, the dials are fired again to bond the glaze on to the dial, creating the deep, rich finish and subtle blue hue by which Arita porcelain is distinguished. After this, the holes for the date window and hands are cut by laser. Finally, the dials are fired one last time to smoothen the surfaces that have been cut. And, no, pictures don’t do justice in depicting the dials’ Arita porcelain finish. One has to see them up close, in person, to appreciate the nuances. For most, that chance will come in September when the Presage Arita Porcelain Dial series reaches Seiko Boutiques and select Seiko retailers worldwide. This is no foolish prank.